Note the exterior wall on slab. The slab is far bigger than the shed. This is the worst possible way to build. Water in a driving rain will leak into the shed under the wall and wood rot over time is guaranteed. Copyright 2018 Family Handyman - Photo used per the Fair Use Doctrine. "I do NOT make a normal practice of bashing my peers, but this instance is so egregious I had to point it out." An exterior wall must be placed on the outside edge of the slab so the exterior siding laps down and over the edge of the slab. This prevents water from leaking under the bottom of the wall to the inside of the building. 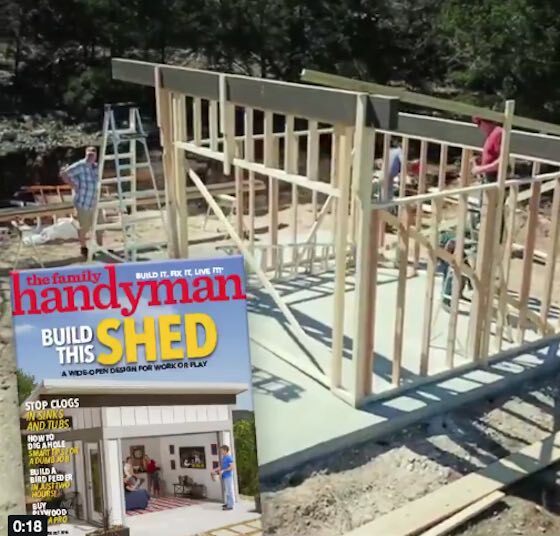 Consider a Wood Shed Floor - Treated Lumber Joists AND Plywood! I was prompted to create this page because of a short video and magazine cover created by Family Handyman. They were building a retro shed on a concrete slab. The issue I had is the entire shed sat inboard on the slab. 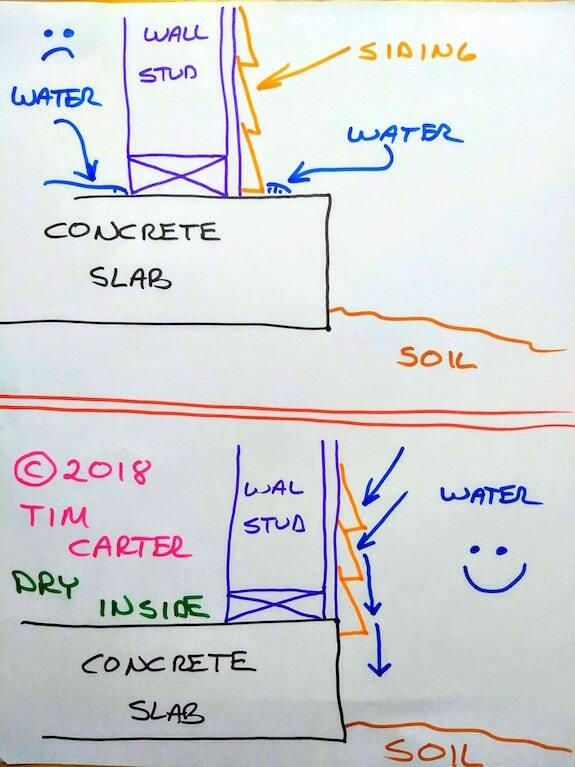 There was at least a 16-inch border of concrete slab showing as you can see in the copyrighted screenshot I captured using the Fair Use Doctrine. Building this way promotes wood rot and it invites water into the shed. It's the worst possible way to set an exterior wall on a slab. It's important to realize that the information you see in other publications is not always accurate and in your best interests. My guess is the editor of Family Handyman magazine who approved this project has never had to replace a rotted wood wall or rotted wood siding on a shed built this way. She or he also has never had to deal with water leaking into a shed is another guess. I do NOT make a normal practice of bashing my peers, but this instance is so egregious I had to point it out. CLICK HERE to get FREE & FAST BIDS from local shed builders. What is the Best Exterior Wall on Slab Placement? The following illustration shows you a cross-section of what Family Handyman is promoting in the top view. The bottom side view shows the proper exterior wall on slab placement. Ideally, you'd want at least 6 inches of slab exposed between the bottom of the siding and the start of the soil. Here are two videos that do a good job of showing you a better way to build. In the first one, the homeowner or contractor goes the extra mile and has his wall OVERHANG the edge of the slab by 1/2 inch! You'll see this about one minute into the video. What about the lack of a header above what appears to be a large door opening at the front of the building? does this hold true when placing stair stringers on the landing platform. My daughter is having this problem with an addition that was built on an existing patio slab that extends about 3" -4" past the exterior siding. Is there a way to correct without tearing down the entire addition? It seems if the roof overhangs the slab & pressure treated wood sill plates are used, it might not be as critical as expressed. I can imagine why some extra slab may be desirable. & sloping the slab properly may be a equalizing technique. What do you do if you want an oversized slab so that you can store things outside beside the shed? Is putting a course of block on the slab, below the sill plate enough to stop the water? Simple. Pour a secondary slab away from the shed making sure there's at least 6 inches of space from the top of the secondary slab to the bottom of the wood siding. Re: exterior wall on slab. I would also put a sheet of plastic underneath the sill plate and staple it up the outside to prevent contact of the bottom sill with the concrete. Also dig down a foot trench around the slab and fill with gravel in the case of excess rain flooding or piles of snow melt against the side from forcing it's way into crevice at the bottom. GREAT JOB. COMMON SENSE PREVAILS AGAIN. THANK YOU TIM. Hey Tim besides the slab issue, where is the proper header for the door opening? Putting the exterior walls in side the slab edge was so out of line, that I did not see it right away. I was looking more at the upper structure and finding some issues. Such as questionable support for the upper beam and why have a beam on the lower bearing wall. If for some reason the walls need to be in like that, the wood structure needs to be raised and bearing on waterproof bases. Your detail is much better, however the sheathing sits on the concrete. The wall studs should align with the slab edge and the sheathing outside not allowing for any water wicking. The siding is not enough. My details show a pressure treated sill with its edge aligned or a slight overhang past the concrete edge. On thing I learned from an outbuilding supplier was to have a 1/2" sill overhang to allow for a slightly wavy foundation wall. The outbuilding kit can not be adjusted like a normal stick frame can. Then on top of the PT sill is the wall shoe and studs. I live and work at the Connecticut coast. The hurricane potential adds more anchorage requirements for lateral and uplift resisting requirements. We may have a hurricane here later this week. I am also familiar with portal framing for big openings flanked with little brace wall each side. Many wall & building sections in my hard drive. How to fix the problem without tearing down the shed? I suppose you could build new exterior walls around the existing shed! They would provide a semi-useful space for storing lumber, pipe, radio-tower sections, and/or firewood, between the original walls and the outer walls. The original sheathing might be salvageable for the new walls. Is the placement of walls relative to slab something that a building-code should catch? Around here, building a permanent shed (on slab) would require a building permit inspection before construction. That's what I saw too and thought was the oops. Tim, how about mounting the wall on a course of concrete blocks so the wood isn't on the floor ? Not such a good idea. The water on the outboard part of the slab will just leak under the row of block. Do it as you see above in my sketch. That's a time-tested method to ensure no water gets inside. Think of how bird and duck feathers work. Our condo subdivision in central Ohio is 18 years old and we are in the process of repairing dry rot from this exact problem! Since it's only an inch or two overhang, our contractor suggested putting flashing under the wall and over the concrete (after repairing the damage). I had an old garage where it was on a slab at grade height. After MANY (80?) years, the sill rotted (probably before that, it was bad when I bought the house). When I replaced the garage I had a slab poured inside 8" block foundation walls, in order to get the sill plate about 8" above grade so I, and subsequent owners, will not need to worry about the sill rotting away. I would not set exterior walls on a slab unless it was at least 8" above grade! Don't care about accepted practices, this experience tells me no way! So I unfortunately have this exact same problem. I have a wood shed with stucco finished walls that was built many years ago on the shoreline of a dock in South FL. The water seeps into the shed around the walls and under the door which is also level with dock. I need to replace the wood that has rotted and find a way to prevent the water from seeping, but I have to keep the current structure as it is grandfathered in and can not be rebuilt due to changes in building codes. I ran into a similar scenario 20 years ago with a house addition on a slab (I inherited the issue). My solution at the time was to remove the warped exterior wall, add flashing, new wall, vapor barrier, siding, sealing, and more sealing on the foundation. It hasn't had any molding, moisture issues or warping in since. It is exposed to water during a rain. I’m getting ready to build a 10x12 shed. 1/2” ply with 12” lap siding. My question is should I bring my sheeting down all the way to the bottom plate? How do I protect the very bottom of the ply from rotting? Thanks.